When I am walking my dog and he starts to bark, if I can, I turn around and walk the other way. I don’t let him continue to be inappropriate, with me there begging “please stop”, as that almost reinforces his behavior. 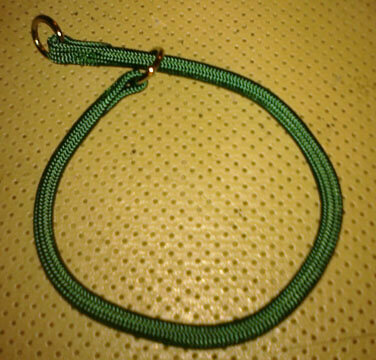 I always use a special walking collar like the one shown below. It’s round, smooth and has some padding so that when my boy pulls against it, it flattens and conforms to his neck. He’s then much easier to control; such collars are great bark busters. A filled choke collar, also called a “mountain choke) flattens with pressure and does not cut into your dog’s neck like a regular nylon or metal choke collar. It is therefore much kinder, and that’s the whole idea; to get your dog’s attention without hurting him. 1. Put the choke together like in the above picture. 2. Slide the collar over your dog’s head and pull it up with the metal loops at the top of his neck and the collar snug under his chin. 3. Have the collar make a “P” so when your dog walks on your left, the choke releases immediately when the pressure is off. 4. Use a 4 to 5 foot leash, no longer. This is not the time for a long leash or a retractable. 5. Walk briskly and confidently. 6. Do not have your dog greet other dogs at all at this time. 7. When Beau sees another dog and strains to go there, pull his front about 4 inches off the ground, using the collar, and keep walking. Do not say anything. Make no eye contact. Use the big muscle groups of your arm for this, not your wrist. You can look towards your Silky but not AT him. Keep his front feet off the ground until he relaxes. Then put his front down and continue walking. 8. If you are walking towards another dog, turn and walk at right angles to the other dog. Pick up your boy’s front feet as above. Keep walking until he relaxes. 9. Eventually your boy will get more used to listening to you and remaining with you during his walks. Perhaps he will eventually be able to accept another strange dog again. No matter what else occurs, you will both have a lot less stress. Sometimes going in another direction isn’t an option. In this case I speed up a bit, hold my dog tight to my side and pull him up, almost off his front feet. The lighter mass of a small dog and the good walking collar allows me to do this humanely; I wouldn’t recommend it without the correct collar or with a bigger dog. There’s nothing verbal here; the physical corrections make the point. Sometimes (on a walk or in the back yard) your dog will bark at the neighbor’s cat, a passing motorist or the grass blowing in the breeze. First of all you should realize that there are some circumstances where your dog WILL bark. Some breeds bark more than others. If you have done your homework, you’ll know where your chosen breed falls on the “bark-o-meter”. Then it’s your job to not put him in circumstances where his barking is unacceptable. For example, we had a Parsons Russell stay with us once for a month. I learned very quickly not to put her out in the back yard after 10 pm, because every little noise at that time of night set her off. Let’s just say that the neighbors were not amused. Dogs will sometimes bark in their crates. First, check out Crate Training for Dogs That Hate Crates. Then make sure to cover your dog’s crate, so he knows he’s off duty. If this doesn’t help, a thin stream of water from a spray bottle will distract him — then “No bark! Good boy!” will get his attention. 1.If Aunt Mary is over and her cane sends your dog into a tizzy, you can have him do a trick or two (see Tricks as Distraction). This will often settle him and the cause of concern won’t seem to be such a big deal. 2. There are definitely bark busting magic tricks. Here’s a good one: Use a small can half filled with pennies. When your buddy barks excessively, throw the can. He’ll stop in surprise. THEN say “No bark! Good boy!” Timing is everthing. 4. And last but certainly not least, quality obedience training that allows your dog to have fun with you, to do work with you, to spend time with you, is practically a magical cure-all. When you teach him to listen to you when you say “Sit!” he’ll start to listen to you more in all ways.